Former US Secretary of State and WOV Honoree Hillary Clinton speaks onstage at the Ms. Foundation for Women 2017 Gloria Awards Gala & After Party at Capitale on May 3, 2017 in New York City. On the night Hillary Clinton lost her race for the presidency, supporters consoled each other through tears and total shock while a clean up crew began packing up celebratory party favors. Bunny Burson, an artist had who worked under Bill Clinton's administration, decided to create inspirational art out of the defeated moment, the Riverfront Times in St. Louis, Missouri, reported. The David Bruno Art Gallery in St. Louis is now displaying Burson's art installation featuring the same confetti that would have been used at the Jacob Javits Convention Center in New York if Hillary Clinton had won the election. "I was among her supporters at the Javits Center waiting for the symbolic shattering of the glass ceiling and the shard like confetti to fall down on us. We left the ​Javits Center at 2 in the morning with profound emptiness,"Burson said by email. "I decided to track it down to use in my work. I wanted to fill that emptiness with hope by giving voice to my feelings that even in defeat​ Hillary’s confetti could be used to inspire the next generations of little girls and young women to dream big and to act on their dreams." Burson said she called everyone she knew to find the confetti. "I was told everything from ​'​it ha​s​ probably been destroyed​,'​ to 'call so and so' in Arkansas, Boston, or Connecticut, Illinois, D.C, or New York," Burson said. Burson said that learning from the 2000 and 2016 elections has been a painful process. The installation, which is lit for 24 hours and seven days a week until August, shows confetti continuously swirling inside of a glass casing marked with the words “And Still I Rise.” Women singing the song "Quiet" by MILCK plays in the background. The song debuted at the Women's March in Washington and spread across social media. 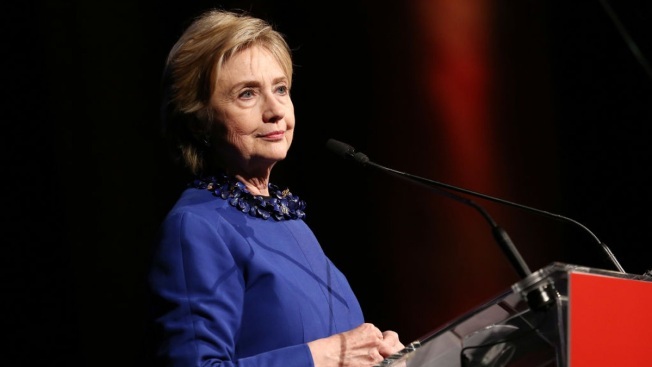 Eight months after the elections, Hillary Clinton will return to the Jacob Javits Center in June to discuss her upcoming and untitled book of essays at the annual BookExpo. The book is expected to address her loss to Trump, The Associated Press reported.